As your young graduate gets ready to set off on a new journey be sure to include this lovely Engraved Graduation Keepsake as a lasting memento wishing for dreams to come true. 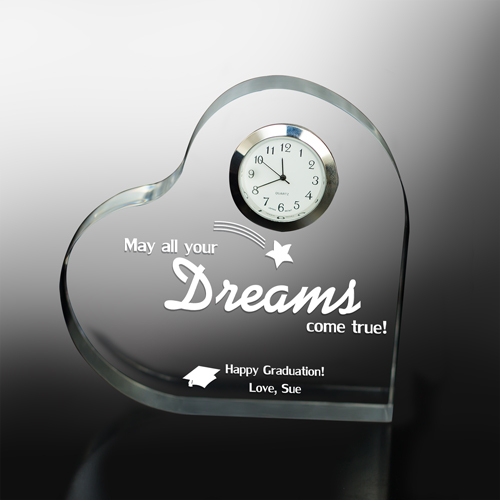 Our elegantly clear Dreams Come True Personalized Graduation Keepsake Heart Clock measures 5" x 5" with edges measuring 3/4" thick, featuring a silver edged timepiece with quartz movement. Includes FREE Personalization! Personalize your Graduation Keepsake with any two line message. It was a graduation gift sent directly to FL recipient; have not had any acknowledgement as yet. Item in print seems to be fine - useful and decorative for an upcoming college dorm. As high school or college graduation comes it is time to say good bye and time to say hello to your new future. Your memories of graduation are very important and will last a lifetime. Treasure these fond memories with personalized graduate gifts from GiftsForYouNow.com.